With massive research efforts underway globally to lift the yield potential of wheat, part of that challenge must include preventing yield losses due to common and pervasive infectious diseases. At the International Maize and Wheat Improvement Center’s (CIMMYT) Turkey facility, my special interest is in root diseases. The work we undertake is focused on methods to screen global genetic resources for new sources of resistance that can ultimately improve yields in growers’ paddocks. This approach incorporates the use of gene mapping populations to delineate associations between novel resistance traits and DNA markers that breeders can use to include the new traits into their variety development programs. 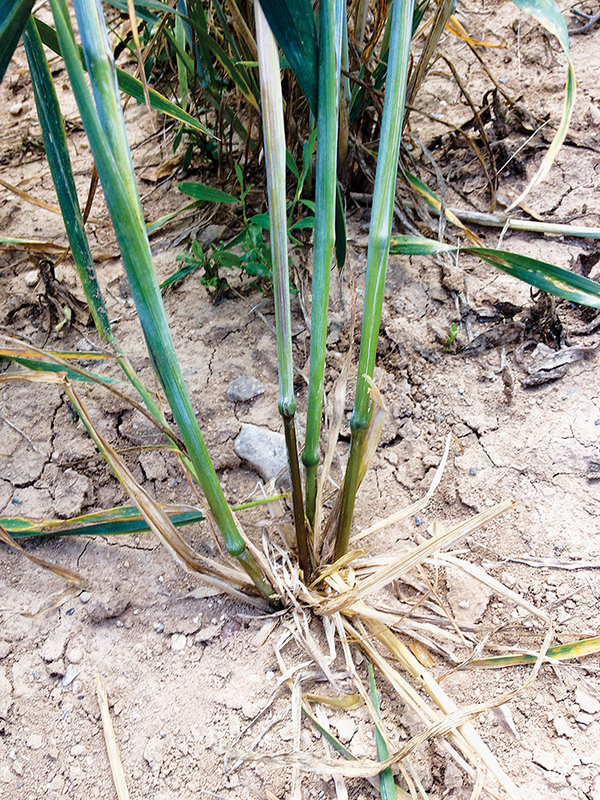 Crown rot symptoms on wheat stem in Yozgat, Turkey, in 2015. Of particular concern are diseases that cause increased damage under drought conditions. Prime among these pathogens are dryland crown rot (Fusarium culmorum and F. pseudograminearum) and root lesion nematodes (Pratylenchus thornei and P. neglectus). While these disease agents cause significant wheat yield losses worldwide, the impact in Australia can be extreme. Under drought conditions, crown rot alone can cause yield losses of up to 90 per cent (durum wheat) and 50 per cent (bread wheat), costing the Australian grain industry as much as $80 million or more each year. The comparable costs for root nematodes are more than $50 million (for P. thornei) and $73 million (for P. neglectus). understanding the genetic mechanism of moderate resistance to crown rot and root lesion nematodes in at least 200 spring wheat and durum germplasm lines from both Australian and CIMMYT materials. Participating in these efforts is Australian PhD student Joseph Barry, from the University of Southern Queensland, who is undertaking part of his studies at CIMMYT-Turkey, with the support of the GRDC. His focus is to understand the mechanisms that make resistance possible in order to refine and progress the development of resistant varieties into the future. For Mr Barry, the focus is on the growth patterns of two crown rot pathogens (F. culmorum or F. pseudograminearum) in wheat, in a project jointly supervised by Professor Mark Sutherland in collaboration with CIMMYT-Turkey. This three-year project aims to examine the field performance – in Australia and Turkey – of 20 wheat lines that carry sources of partial resistance to crown rot when inoculated with either F. culmorum or F. pseudograminearum, or both. The lines include a set of standards that range in susceptibility to crown rot and a selection of partially resistant lines sourced from the University of Sydney, the University of Southern Queensland and CIMMYT pre-breeding programs. DNA-based technologies make it possible to compare the distribution of the two pathogen species in the host tissue. Trials will take place at four locations: Longerenong Agricultural College in Victoria; Wellcamp in Queensland (F. pseudograminearum only); Konya in Turkey (F. culmorum only); and Yozgat in Turkey (F. culmorum and F. pseudograminearum). In 2015, Mr Barry and Professor Sutherland visited trial sites of the Soil Borne Pathogens CIMMYT-Turkey Program. 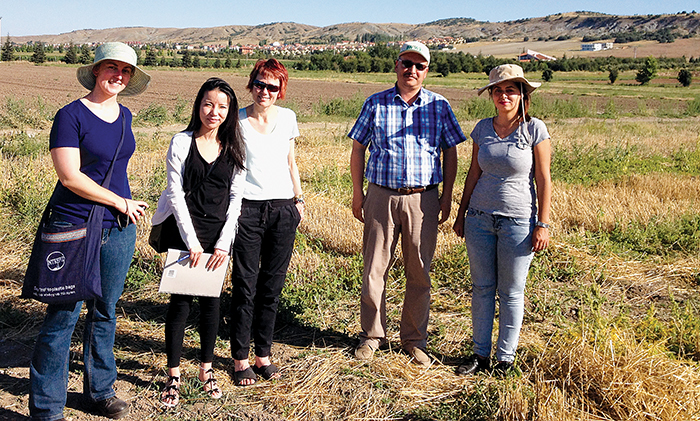 Over two months, Mr Barry took stem and soil samples from the trial site in Yozgat. Along with extracted DNA, these samples were sent to Australia for further study. 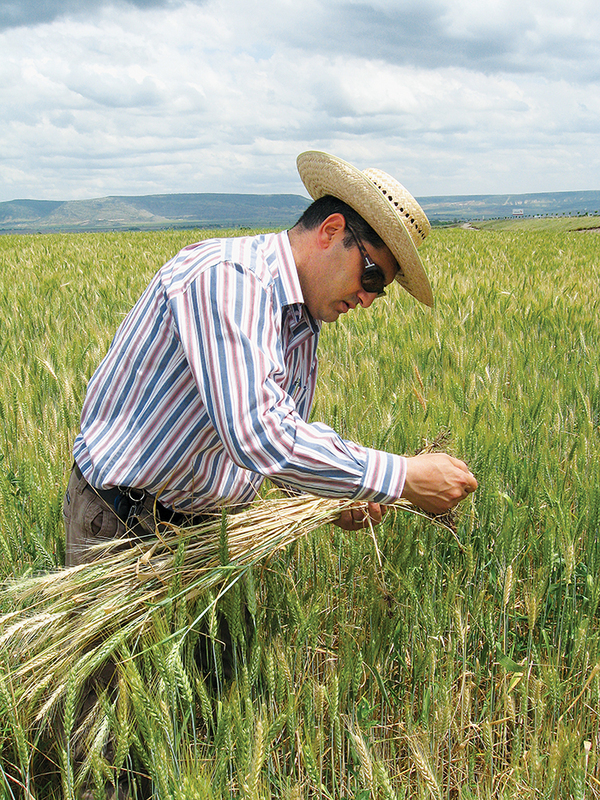 A major component of CIMMYT-Turkey’s work on root diseases involves screening the high-yielding, adapted durum and spring wheat germplasm developed at CIMMYT-Mexico to identify novel forms of resistance to multiple soil-borne pathogens and to map their genetic basis. A complementary process in Mexico rapidly crosses elite Australian and resistant CIMMYT germplasm (at a rate of two generations per year) before they are sent to Turkey to test their resistance to crown rot and root lesion nematodes pathogens under field conditions. Once validated, the best lines are delivered to Australia through the CAIGE program for further validation. Lines that perform well in Australia are available to breeders to develop more resistant varieties. A good example is the northern wheat variety Suntop, which has good tolerance to root lesion nematodes. It was developed by Australian Grain Technologies by crossing Australian and CIMMYT breeding lines. This process inherently produces populations that can be used to map the genetic basis of the novel forms of resistance identified by CIMMYT. Recent discoveries include seven genomic sites associated with novel resistance to P. neglectus and three to P. thornei. These represent new sources of resistance and the populations generated by crossing Australian elite germplasm play an important role. Taken together, the activities within the collaborative partnership between CIMMYT and Australia are successfully developing high-yielding durum and spring wheat lines with enhanced and more varied sources of resistance to soil-borne pathogens than currently used in Australia. (From left) GRDC Scholar Lea Meagher visiting CIMMYT-Turkey facilities with Dr Chong You (Statistics for the Australian Grains Industry (SAGI)), Dr Beverley Gogel (SAGI), Dr Savas Belen (wheat breeder at Transitional Zone Agricultural Research Institute, Eskisehir) and Dr Gul Erginbas. * Dr Amer Dababat, a native of Palestine’s West Bank, has led the Soil Borne Pathogens program at CIMMYT-Turkey in Ankara since 2011. He received his PhD from the University of Bonn, Germany, and has also studied at An-Najah National University in Nablus, the University of Jordan in Amman and worked at the Palestinian National Agriculture Research Center on a trilateral project between Germany, Israel and Palestine looking at root knot nematodes. Along the way he has co-supervised more than 17 master’s and PhD students from around the world and has published more than 40 peer-reviewed articles. Read this article in GC North; Overseas; South issue 122 - Subscribe and recieve the hard copy of GroundCover in your mailbox for free, remember to select 'Post' as your subscription method.